The other night Jim and Terry Uffelman and I made a simple but delicious meal for ourselves cooking pepper steaks with “grains of paradise”. I am going to write it out in prose style to stress how easy it is to make dinner. First of all, we bought steaks at Bryan’s, a bag of new potatoes, and one of green beans. And, we made sure to roast extra potatoes and blanch extra green beans to use in a “salad Nicoise” of pepper-garlic salmon another day. 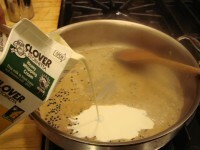 First, put a tablespoon of grains of paradise (or equal amounts of allspice, white and black pepper) in a plastic bag and pound it to crack the seeds. Sprinkle this on 1-1/2 lb. 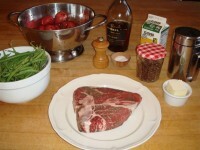 of excellent quality steak or steaks (about 1-1/2 inches thick) with about 1/2 tablespoon of Fleur de Sel. Let this sit until ready to panfry. Wash the potatoes, cut the large ones in half, put on a baking sheet, coat with olive oil, and sprinkle with coarse salt and freshly ground black pepper. Put these in a 400 degree oven for about 20 minutes, until tender when pierced with a fork. Meanwhile, bring a pan of water to the boil. I like to trim both ends of the green beans. When the water is boiling, add a half a teaspoon of salt and drop in the green beans. Continue boiling until they are tender when pierced with a fork, about 8 minutes. While the beans are cooking, put a spoonful each of butter and olive oil in a saute pan, and let heat until it begins to brown. Put in the steak (or steaks) and let them cook over high heat, but not so high to burn the fat, until the steak is nicely browned. Turn with tongs and cook on the other side. 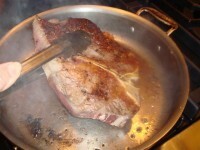 The most important thing about pan-frying is not to crowd the pan and not to push the meat around. 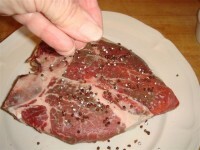 When the steak is slightly firm to the touch, remove and let cool just a minute. 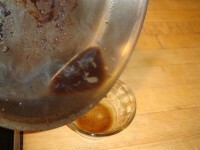 Pour off the fat in the pan, and, without hesitation, pour in about 1/3 cup brandy. Stand back in case it catches on fire. When the alcohol in the brandy has cooked off add some cream and let it boil a minute more. 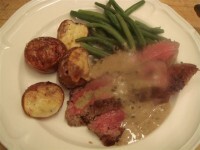 Arrange the potatoes and green beans on warmed plates. Slice the steaks at a diagonal and arrange also on the plates (without any plate showing in the middle), spoon over some of the sauce, and serve with a full-bodied red wine. If you are indeed making extra green beans, be sure to rinse them in cold water to stop the cooking. This is called “blanching”. It is common in restaurant cooking. The beans can then be reheated by dropping again in boiling water, or simply warming with butter or olive oil in a saucepan.